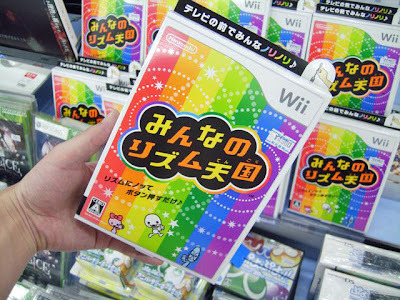 I was planning to wait and buy Rhythm Heaven Wii when it arrives on North American shores sometime later this year, but after reading these impressions and seeing these videos of the just-released Japanese iteration of the game I'm seriously considering changing those plans and buying the Japanese version now and the North American one this fall. haha, I knew that would be Idol without even clicking. Hey there, Simon #2! (I'm calling you that because another Simon frequently visits and comments here, too.) Yeah, the "I Suppose" mini-game in the NA version of Rhythm Heaven DS is ... sad. I'm guessing the folks at NOA responsible for this game's localization just asked one of their colleagues to do the vocals for this track. How else could it be explained?? I tried the japanese version of the ds tengoku, as I was thinking it would be similar to Ouendan in terms of understanding what to do. It turned out I really needed english instructions to get all the mini games. It's a shame though, I suppose yeah! Sorry to hear that, Linnea! I was able to make my way through the GBA and DS Rhythm Tengokus with just a bit trial and error (I don't know any Japanese), but I can understand why most people would find that daunting. I'm guessing the same is true of the Japanese version of the Wii release -- it can be beaten w/o knowing the language, but you'll probably stumble a bit along the way. Anyway, I'll let you know if that's the case or not if I actually buy the Japanese version of the game. I love the "I suppose" game on the DS...but I'd never heard the other version. Hmm. Already picked up the JP version :) Pretty darn good if you ask me! And I didjnt have any trouble in the game besides for a level with lobsters... Gah, that one Just had my mind bogging for a entire half hour! Hey there, Antonio! Oh, sure, rub my nose in it! Just kidding :) I'm glad to know you've been able to get through the game well enough. Hopefully I'll get to play it soon myself. Anyway, what are your favorite levels so far? Well, honestly I like one of the endless games you can unlock :). The endless game itself mixes three of the mini games from the DS version into one! I won't spoilier which games, but just remember you'll be seeing some familiar faces! Oh, you've got me curious now! I can't imagine how three of the mini-games from the DS version could be combined into an endless game in this version, to tell you the truth. I guess I'll find out sooner or later, though. Anyway, thanks for sharing your thoughts on this game!